Oh my! Just a couple more days and we are faced with trying to remember to write the year 2019 instead of 2018. Wonder why this is often such a challenge? Maybe a mental block on my part! 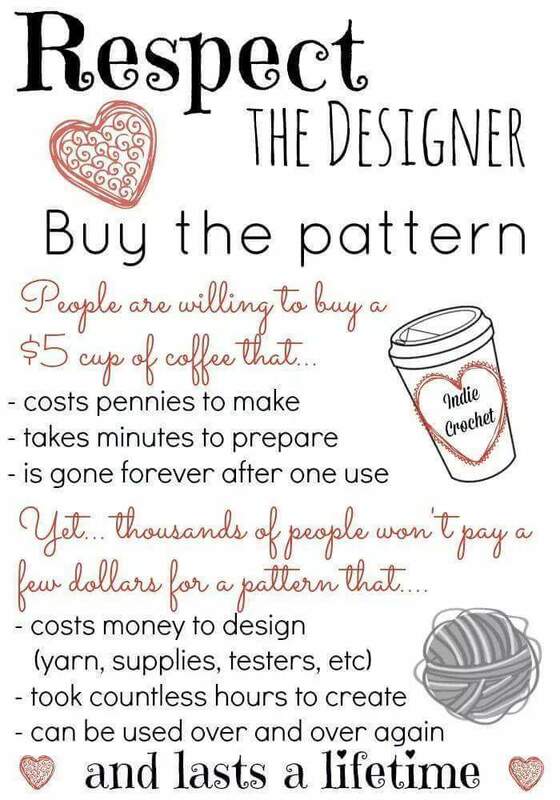 I was sitting working on stitch guides for the Needle Nook of La Jolla Get Away coming soon when this popped up in my feed. 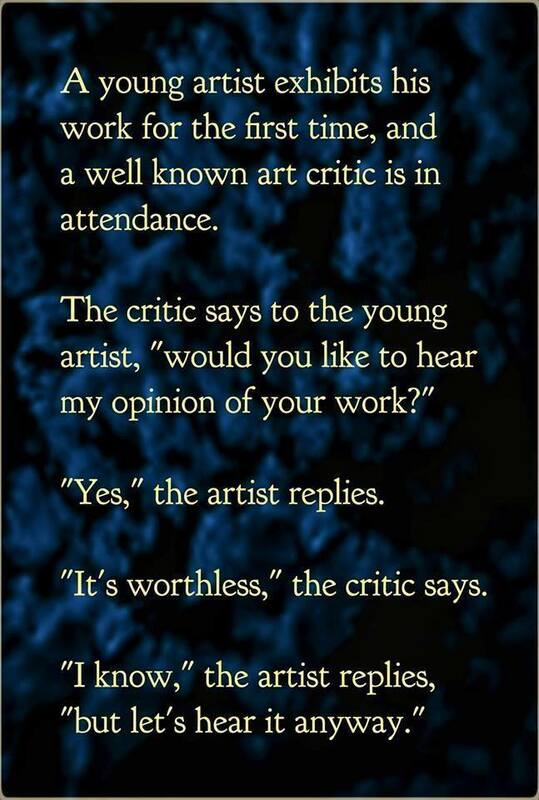 I just thought this is so true and I wanted to take the space to share it with you. Your support and encouragement are always appreciated and I wanted to thank you again and assure you that you are not taken for granted! I know you have many choices and I am honored and humbled to be one of them. Christmas is now another wonderful memory and we are beginning our focus on what is on the horizon. First up will be the new Online Mystery Classes for 2019! For those of you who follow closely, check out the post of September 1 and you can print out the 2019 Agenda for the upcoming Online Mystery Classes. We really have some fun things in store and I'm sure you won't want to miss them. First up is the cute, cute Dana - Life of the Party from Penny MacLeod. In just a few short weeks we will be sharing our first lesson on this happy piece. 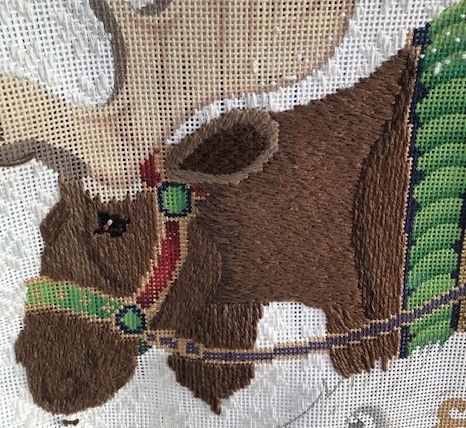 It has been such fun to stitch and I know that you are going to love it too! Just how many ways can you stitch a 3x3 square? This piece has also been a surprise to me as it has really fooled me on the amount of thread needed. I will be sharing that information with the class participants as soon as I have finalized the requirements. 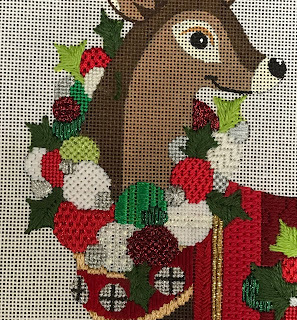 The first installment for the special series of Raymond Crawford's Reindeer with the Poinsettia Blanket is on schedule as well. I must say that this was my favorite from the get-go. I love poinsettias and I deliberately placed it last on the agenda for fear I would not give the others the attention they deserved. 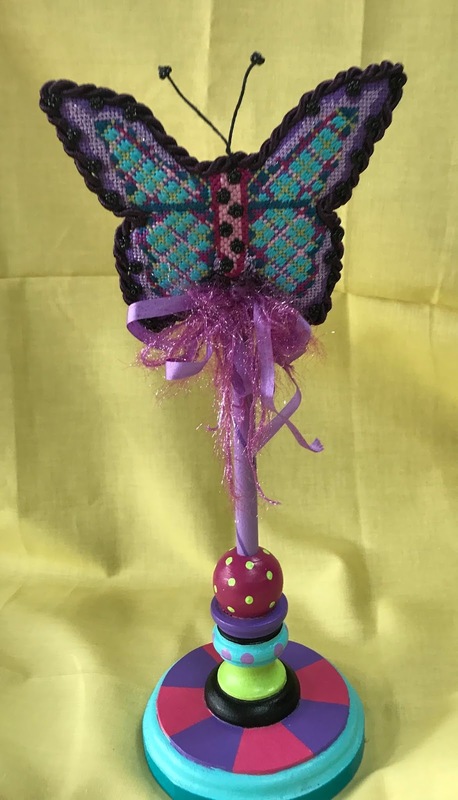 Then for those seeking instant gratification we have the first in our series of 8 Quickie Butterflies from Burnette and Bradley. Invoices have been sent and most have been processed in preparation to begin these two new adventures. If you did not get your invoice for either, be sure to notify us so we can get you all ready to go. Or if you would like to join us that is possible too as long as we have the canvases for the butterflies. Just email us at duodesignsinc@yahoo.com with questions. 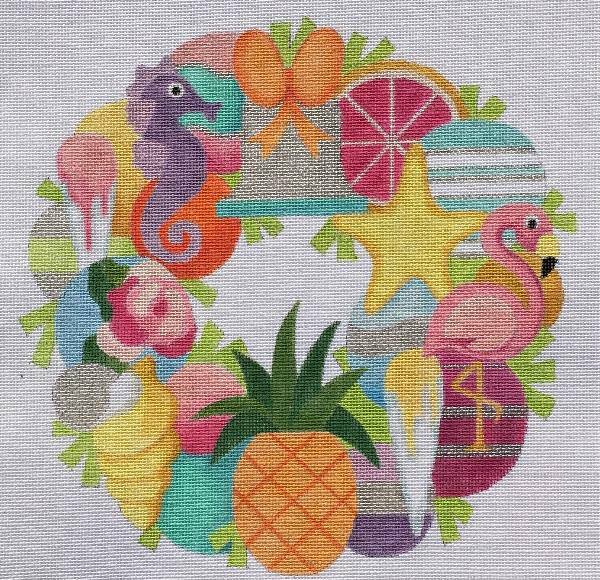 Are you registered for the colorful and happy SeaSide Themed Wreath from Raymond Crawford? Man this guy will utilize a whole bunch of techniques and will be such an adventure. We'll pull out all stops for this one. If you want to participate just send an email to us at duodesignsinc@yahoo.com. First class is scheduled for mid-March. Keep in mind that we always welcome suggestions for new classes to add to our list. 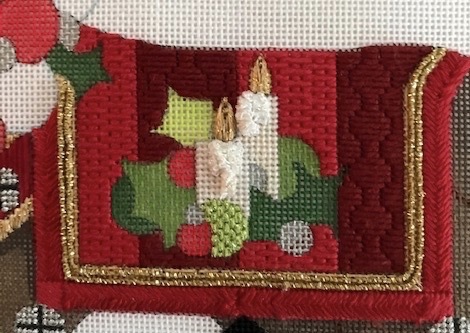 As we have stated before if you can help get a minimum of 15 people to commit to the online class, we will gladly invest the time to set up the class and arrange the lessons with stitch guides. I will say that I am finding that the medium to smaller sized canvases are becoming more popular so I will likely not be adding any more huge projects to our agenda. 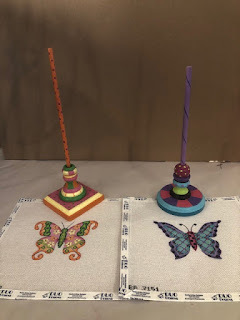 Next focus is our new Etsy Shop - duodesignsbysandra - no spaces - Etsy set that up??? Anyway, we have been busy putting items in there to share with you guys. This was set up mostly to sell off surpluses from my classes. I always order way too much so this is a way to share some of that with you. It has also proven to be a good venue for our books. I wasn't expecting that. So we'll see how that goes. Be sure to mark as a favorite on my shop. 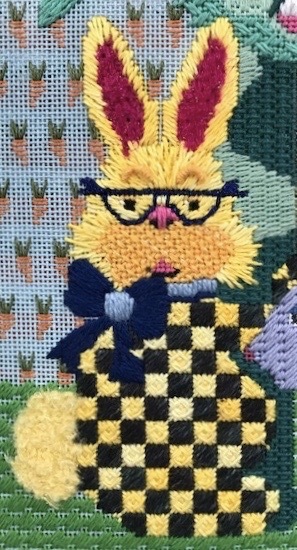 We do have a special for our Shapes of Needlepoint Books. If you purchase all 4 books at once you will be given free shipping (approximately $40)! So be sure to check that out. 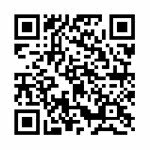 There is a large listing of digital stitch guides and I continue to add those as I can sneak one in every now and then. Problem could be that I may not be able to keep up both the website and the Etsy Shop. Time will tell. And we are placing into high gear our concentration on our upcoming stitching cruise - Mediterranean Stitching Memories 2019! Be sure to join our exclusive Facebook page at Needles 'N Fins Stitching Adventures to keep up with all the plans. 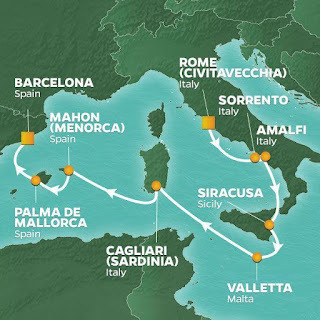 October 2019 is going to be so exciting with all the ports we will be visiting from Rome to Barcelona! We need to get some stitching in that 2nd gal's hands - if she's not drinking she should be stitching! Have a very safe New Year's for those out and about and I wish you all health and happiness for the upcoming new opportunities God has given us. May all your wishes come true in this magical period of time. It is a time of hope for all as we celebrate the birth of our Savior! 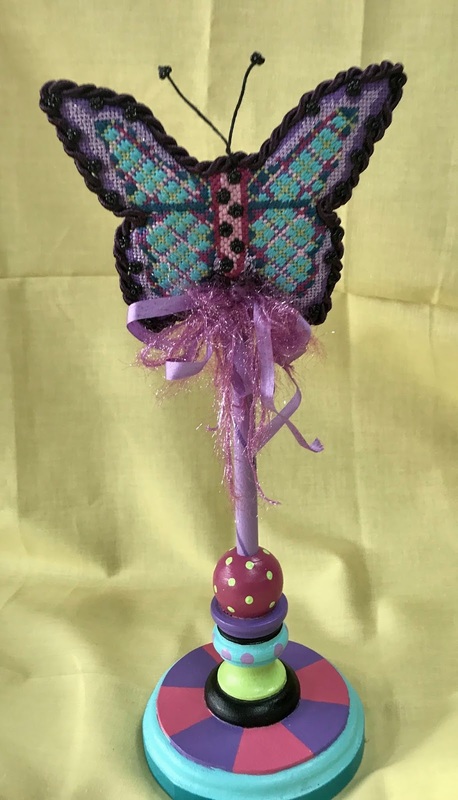 Browse through our new Etsy Shop - DuodesignsbySandra - no spaces. We are continually adding new things. This is mainly stitch guides and surplus class canvases/kits. Please stop in and make us a 'favorite' (having a little friendly competition with a friend on this). Also feel free to email with any suggestions that might help in your search for things or what you would like to see in the Shop. 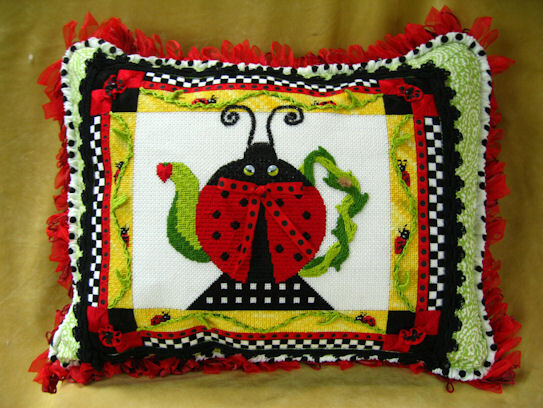 I will be adding laying tools, felting and punch needle tools, roving and other miscellaneous items soon. 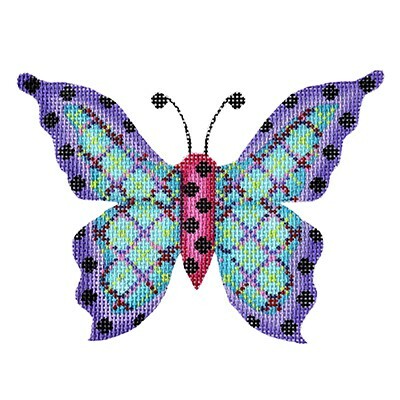 Check back often as I am adding stitch guides almost daily until I get caught up. 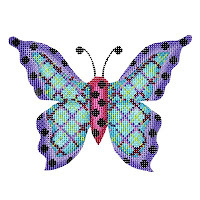 I will also be adding cross stitch packets down the road after the holidays. 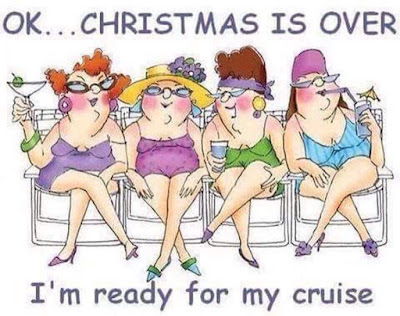 Taking a little break from my normal rambling this weekend but wanted to remind you to be sure and put on that wish list our upcoming fantastic Mediterranean Stitching Memories 2019 Stitching Cruise. Go to Needles 'N Fins Stitching Adventures Facebook page and review the updated brochure posted by Liz our agent lwolak@vikingtvl.com. There are additional stateroom options available that she has been able to acquire for us. While over at Needles 'N Fins feel free to ask questions as many have taken trips with us and they may be able to give you the answers you are seeking. Remember that these small ships provide intimacy and therefore have limited capacity so spaces fill up quickly! Would love to have you join us! Okay, that's it for this weekend! 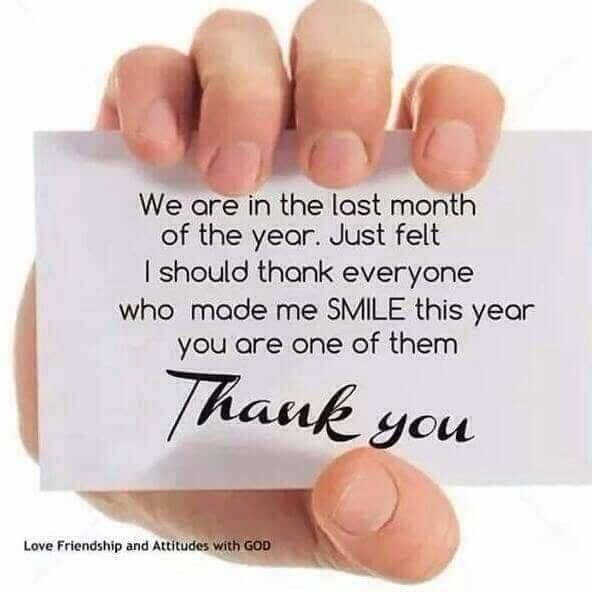 Have a great week and share your time - if it can't be with family or friends - go to volunteer at the many events to assist others and enjoy the interaction of being together. Again, Merry Christmas, Happy Hanukkah or whatever the holiday greeting matches how you celebrate. We only wish you the best! 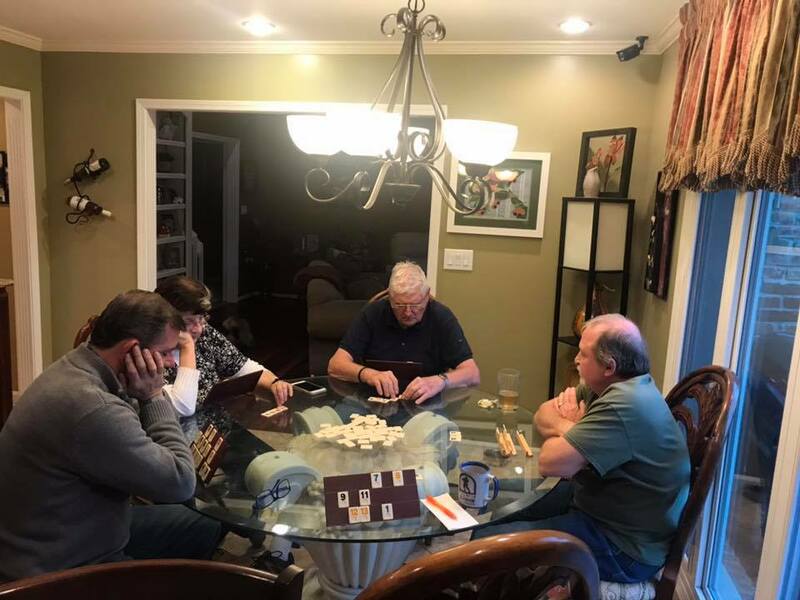 LAST ONLINE MYSTERY CLASSES FOR 2018! We just announced our new adventure. I am experimenting with an Etsy Shop. The purpose of the shop is to first of all offer surplus class items. I always seem to get way too much of everything and I should really let some of it go. Then I also wanted to start selling some of our cross-stitch chartpaks - gotta get those photographed and listed. And then maybe a few beaded things that I play with as a hobby. If you get the opportunity please go check it out and I am open to any suggestions as this is totally foreign to me. 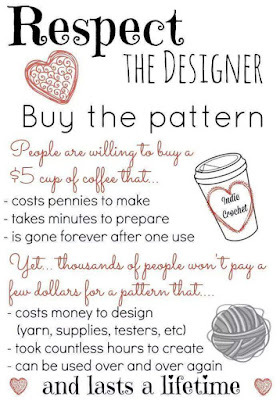 The shop name is DuoDesignsbySandra - not my choice but it works and makes Etsy happy. Lessons are posting today for the mid-December groups. It is unbelieveable that these are the last lessons for the year. We said goodby to a couple of our classes. Our third Reindeer from the Raymond Crawford Series - Reindeer with Candles Blanket received his beautiful collar. This is the last of the year-long project. Can't believe it is over. Let me know if you did not get your invoice or if you want to join us. There is still time - email me at duodesignsinc@yahoo.com. 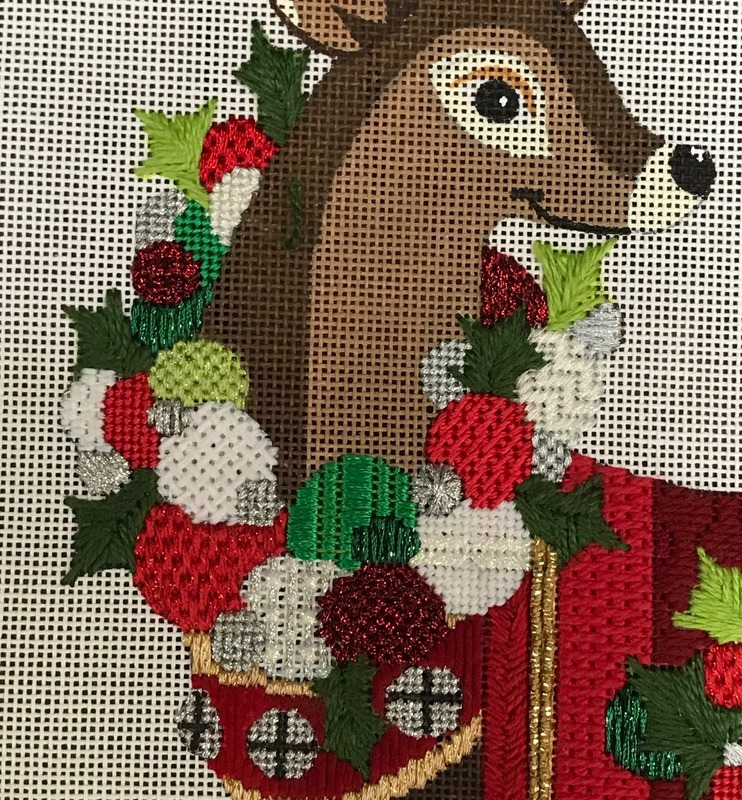 Reindeer - last of the series for us - Reindeer with the Poinsettia Blanket will have its first lesson mid-January. And our first introduction to the Butterfly Quickies - the first in the series of 8 classes. These designs are from Burnett and Bradley. Kit will have enough thread to complete the stitching and beads for the embellishing - including 2 for the antenna. Handpainted Canvas, threads, beads and stitching instructions all for $99. Shipping/Handling is going to be $7. We are thrilled to announce that Deux Bijoux Bijoux has made two custom ornament stands for this Quickie Series. They will work with all 8 of the designs we will be featuring. The stands are $44 each plus S/H. We are taking orders now for them. As you can imagine there is a huge wait list for their fantastic items so if interested be sure to order now and get ahead.We will invoice for a $20 deposit per stand and then invoice for the balance plus S/H when they are ready to ship. Excitement continues to build as we plan our Mediterranean Stitching Memories 2019 stitching cruise. This year we are going to do a little different venue just to experience a different option. While I love the riverboats, I am not opposed to a slightly larger ship. I don't think there is any question as to how I feel about the larger ocean liners but I can handle the smaller ships that go to the Seas such as this beautiful Azamara Pursuit. Another would be the ships that navigate to our Alaskan hopes. Hubby and I are great Hallmark Movie watchers. He naps through most and I stitch through most. But we still enjoy them because they always have a happy ending. I not longer deliberately expose myself to stressful movies. If I can't laugh and enjoy it, then I don't watch it. One of the things that is always included while watching the movies is our dialog. Movie starts and during introduction of the characters we manage to identify the first significant other and comment - he/she doesn't know it yet but they are history! Somebody is always transferred or forced into a different venue - meets someone they don't hit it off with right away - but . . . you know they are going to become an item. Aww but there is more. Hubby has been napping, right? Wakes up - question - have they had the break up yet? Yep, there will be a confrontation of the ex showing up at an awkward moment, then the wrong impression is made by new love interest, then . . . breakup. Return to the original scene and somehow the new love shows up, they make up and everyone lives happily ever after. My kind of movie! OH GOSH - THAT CLOCK SURE IS TICKING! First: I have sent reminders for the upcoming Penny MacLeod - Dana the Life of the Party - class. This first lesson will be posted mid-January so don't miss out. There is still time to join us if you wish. Just email me at duodesignsinc@yahoo.com and I'll get invoice out to you for the 6-lesson packet of $150. 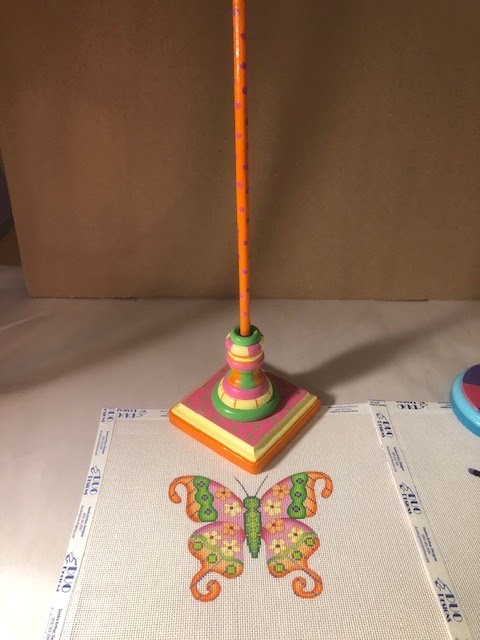 AND: I will be forwarding invoices for the first Butterfly Quickie Class to those who indicated an interest in the class - those should go out mid-week. This class will also begin mid-January. If you still want to participate just pay the invoice. If you are no longer interested just ignore or let me know - duodesignsinc@yahoo.com. If you would like to join this group let me know and we can continue taking students until I run out of kits. This is an all-inclusive, one-time only class. You receive the painted canvas, threads/embellishments, stitch guide lesson all for the price of $99. NOTE: To keep costs down on these projects threads are cut to length needed. 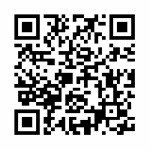 Are you aware that we have many of our stitch guides available for instant download from our website? Just go to duodesignsinc.com and look under the drop-down menu 'Stitch Guides for Sale' and find the ones of interest to you. They are processed through PayPal cart and you will get a pdf to download instantly after funds have cleared. Check in often as we are adding new guides as time permits. Making it short and sweet today - have a great week and tune in next week to see a peek at the results of the Lessons for the Online Mystery Classes. What's a PS that is posted in front of the script instead of after - a prescript? Hmm. I meant to share this with everyone and forgot. I so love this! 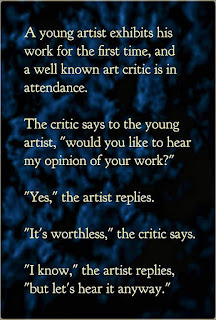 We all need to keep an open mind and faith in our art and our accomplishments! But, this is the first Saturday in December. 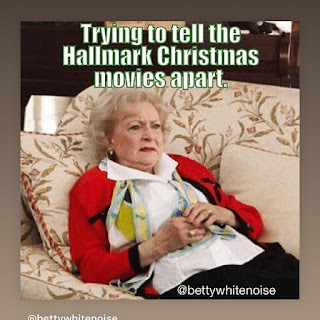 It also means 24 more days until Christmas. Those who observe are bringing out the Advent Calendars. People are starting to panic because Christmas will be here before you know it, etc., etc. When I was a child we did not even think about Christmas, decorating, shopping, etc., this early. In fact we never put the tree up any earlier than 2 weeks before Christmas. I don't know if there was anything magical about 2 weeks but that was the way it was. Also, we lived on a small farm and we had a live tree. Our heat was a 'warm morning' stove in the center of the room. So, I am sure that a live tree drying out might have had something to do with the 'magical' 2 weeks. And if we were lucky we got a Sears catalog - oh my all the beautiful things that we could wish for. We each were allowed to choose one to ask for and a second just in case Santa couldn't get it. This chore encompassed many dreaming hours for me, my younger brother and baby sister. We also had the 'company store' where I am sure is where Daddy got our Christmas items on credit. Somehow when I moved into my adult years and Mommy years, people started shopping earlier and earlier. The toy of the year would be gone if you did not order or lay away (we had lay away where I came from) before Thanksgiving. Then we got into entertaining. Everyone had such full schedules that parties started happening earlier and earlier. 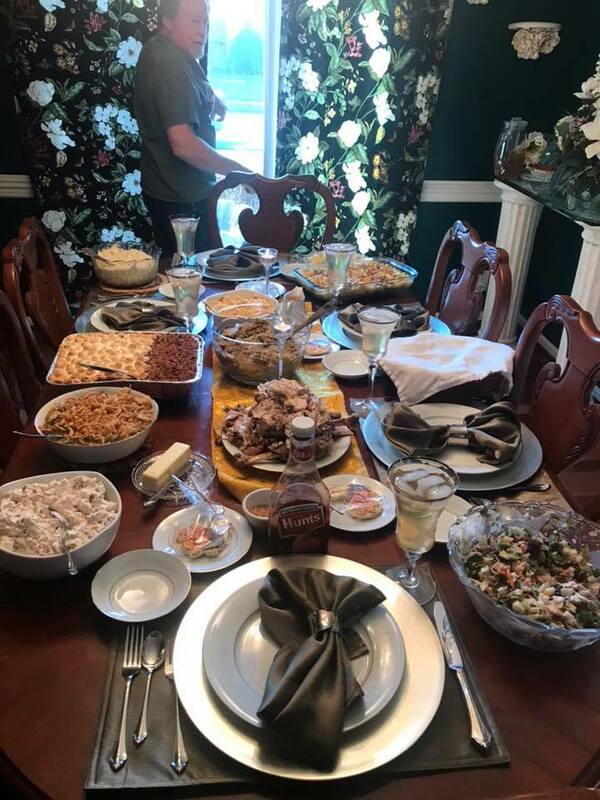 Now it is very common to put up decorations on Thanksgiving (if we even wait that long). Sure is a different time and place. 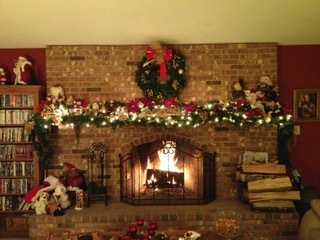 Here at Arthur Acres we have downsized Christmas tremendously. Children are pulled into many directions due to extended families, grandchildren live in other towns and have the same issues, etc. Decorations are now down to about 3 tubs with about 15 more stored in the barn not even opened the last couple of years. Wonder if age has anything to do with this new approach as well? 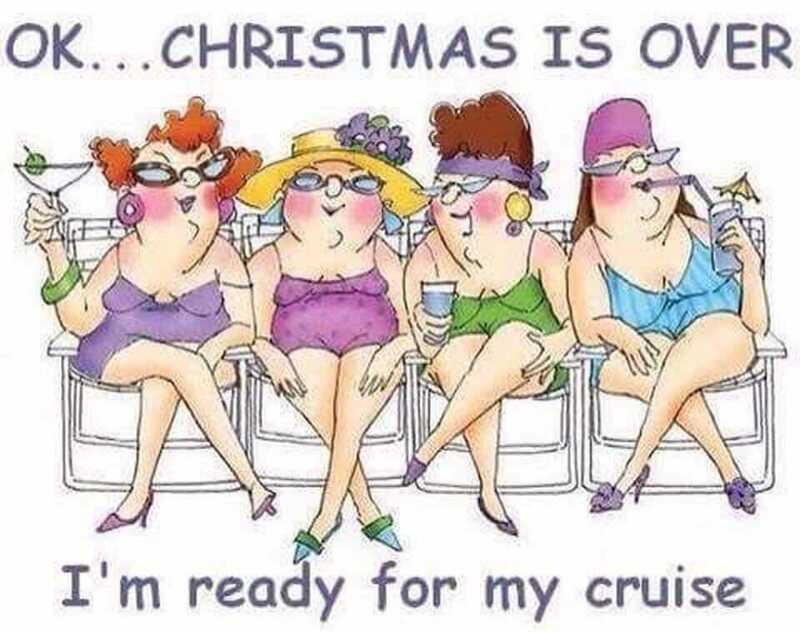 While thinking of Christmas now might be a good time to put our upcoming Stitching Cruise on your wish list. 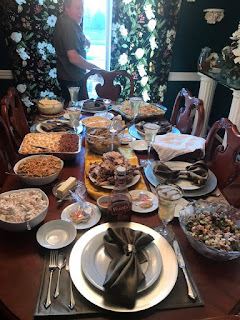 The Mediterranean Stitching Memories 2019 cruise is so exciting. Goodness at all the ports we will be visiting. And all the excursion possibilities for each individual to choose. Rome, Pompeii, Capri, Sicily, Malta, Barcelona - just to name a few. 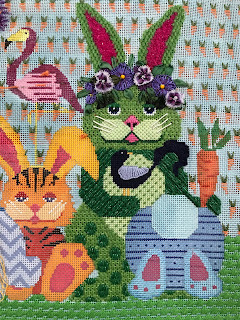 Hop over to Needles 'N Fins Stitching Adventures and review the full brochure. So many exciting choices! I think I can sleep here. Don't waste any time if you are seriously considering this journey. 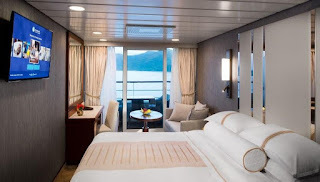 You want to make sure you have the stateroom of choice before they are all gone. There is much interest in this trip. So exciting! 12 Days / Oct 24 - Nov 4, 2019 - Italy, Malta & Spain! A new month also means we will be sharing new lessons in the Online Mystery Class Series. These will be posted and shared around mid-month. 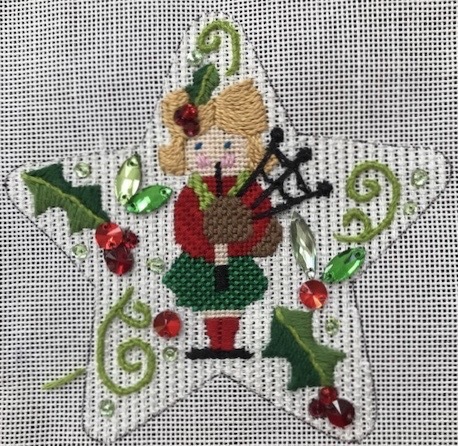 We have not added a new class for December other than the one Quickie - Raymond Crawford's Christmas Stars. It is unbelievable that we have already gone through all 12. At the time it seemed like an eternity didn't it? January we have a couple new things to share in these series. 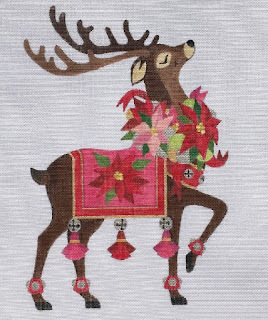 We will be invoicing in a few days for the fourth Reindeer in our series of four. This one will be with the Poinsettia Blanket. Just email us at duodesignsinc@yahoo.com if you would like to sign up for any of these upcoming classes. The full 2019 agenda is posted on September 1, 2018 - scroll back to have a look. ONLINE MYSTERY CLASS PEEK-A-BOO TIME AGAIN! You know these postings are getting closer and closer. So close sometimes that it is scary! We just started some of these and here we are almost finished with many. 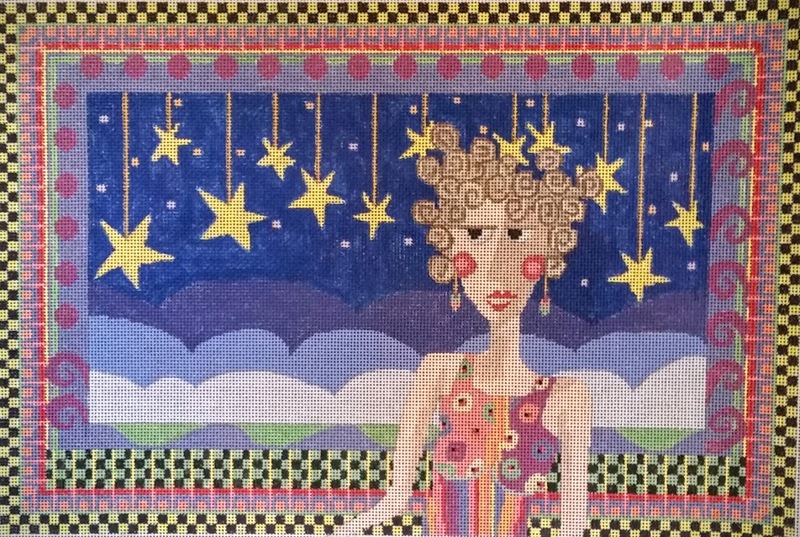 We bid farewell to Moon Gazer, a Brenda Stofft design. This was an experimental class with a couple of others where we offered to do the lessons every other month instead of monthly. I think once we are through all these I will go back to the traditional once a month type class except for the special Quickies, etc. 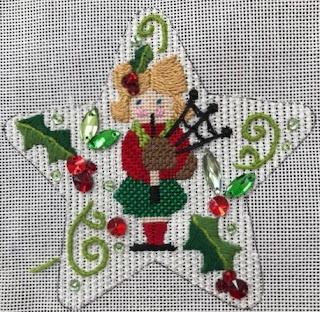 The Pipers are Piping loud and clear on the Raymond Crawford Christmas Stars series. Can you believe only one more to go? Unbelievable. How about those bunnies in Every Bunny Loves Some Bunny from JP Needlepoint? This time we feature Miss Flower Power. It is no secret that I am thoroughly enjoying stitching these cuties. 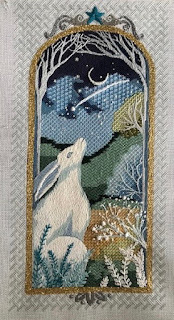 Then we have the third session of the Raymond Crawford Reindeer Series - the Candles Blanket. We are taking registrations for the upcoming January 2019 Classes - the Penny MacLeod piece - Dana - Life of the Party. And the last of the Raymond Crawford Reindeer - Poinsettia Blanket- will begin. Remember to look at the link on the right for the 2019 Online Mystery Classes Agenda if you would be interested I joining us. - For some reason this link isn't working now so scroll down to 9-1-18 posting for the full 2019 Scheduled Agenda. 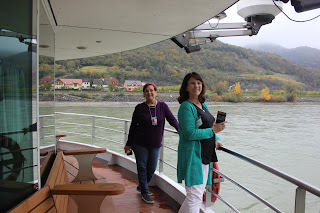 It is still hard to believe that Stitching Down the Danube is now over and only fond memories. I so loved my group. Had many repeaters and several new to our adventures that were special additions as well. What a great way to see different parts of the world with wonderful people feeling safe and looked after and all have the love of needlework as a gluing foundation! We have many couples join us and many singles - some even pair up and share a stateroom. Lots of possibilities. Please try to consider joining us on our next journey - Mediterranean Stitching Memories 2019. We will be doing a different cruise line as we need a slightly larger boat for the Mediterranean Sea than our favorite riverboats. But Azamara has the fantastic Pursuit at our disposal and we have heard nothing but great things about her and the company's service. Join our Needles 'N Fins Stitching Adventures Facebook page and shoot off any questions you might have regarding travel to our agent Liz - lwolak@vikingtvl.com - or stitching questions to me at duodesignsinc@yahoo.com. We'd so love to have you join us. WHO HAS TIME FOR JET LAG? Plans are in full steam ahead for our Mediterranean Stitching Memories 2019! October 24 - November 4, 2019. This one is a little different as we are going out to Sea (not ocean - sea). We will be on a slightly larger ship than our riverboat but still not the massive monstrosities that cruise the ocean - been there, done that. Anyway the Azamara Pursuit is gearing up to host our next adventure. Follow Needles 'N Fins Stitching Adventures Facebook page to keep up with updates and additional information as it develops. Reservations are flying in and we are thrilled at the acceptance of this new adventure. Look at all these ports. We begin our journey in Rome and will finish in Barcelona!! Looks like there is a lot to get into along the way between the two! Hubby's walker might need new treads on the tires at this rate! I'm busily working on an Optional Exclusive stitching project for our adventure. It is in my head - I just gotta get it on the canvas and off to the painters. Also working on various surprises for all my participants because I never want you to be disappointed! You cannot imagine the amount of administrative chores that are involved in the background for getting the stitching end laid out. Forget the travel - I leave that to our expert agent Liz at Viking Travel. I have a full schedule trying to get things organized on the stitching end of our fun trip. We need to arrange rooms at hotels for stitching and then the real challenge is working with the ship to get some fun space there. Supplies need to be decided and ordered. But, hey, that's part of it - right? But if you check with those who have travelled with us before I think they will say that my efforts on their behalf have been rather successful. I have fun doing it and I think it shows! My ultimate goal is that we have fun! We travel, see new things for many of us, stitch a bit and truly enjoy each other's company! I am so proud of the new friendships that have developed on this adventures - especially since they have spilled over into future trips with us! Isn't that wonderful? Well, I'm not fully recovered from our 2 weeks spent around the Danube in spite of what my heading might indicate. Still sorting out things and getting papers together to be filed away. At the same time, I have been polishing off the next series of lessons for the Online Mystery Class postings around the 15th of the month. These are great fun and I am loving how they are developing. If you would like to join us in any of our classes, look to the right of this space and there is a link to the 2019 Online Mystery Class Agenda. Just email me at duodesignsinc@yahoo.com if you would like additional information or want to join us. Additionally for more information on our upcoming Stitching Adventures, be sure to follow our Needles 'N Fins Stitching Adventures Facebook Group. For particular questions on our upcoming Mediterranean Stitching Adventures 2019 contact Liz at lwolak@vikingtvl.com for anything to do with traveling and me for the stitching part at duodesignsinc@yahoo.com. I will share a little something with you - this last trip we actually got Liz stitching! I have proof! So even though we play a lot we do get some fun work done as well. Please come join us on our next adventure!